Imagine this: Your kids were born in Sweden, have Swedish citizenship, speak Swedish, and grew up in Sweden. But still, the U.S. government insists they're Americans -- and Uncle Sam wants to collect taxes. Sound far-fetched? This is the reality for Sarah Gaisler, an American who gave birth to her three sons in Sweden -- and many other expats with children born outside the U.S.
Children born abroad to Americans are generally automatically granted U.S. citizenship -- along with a major tax burden. That's because the U.S. taxes on worldwide income, no matter where its citizens earn or live. And all this is creating a headache for expats who say they don't have a choice in the matter. "It's not that citizenship is a right, but it's actually imposed on your child when they're born abroad," said Gaisler, 36, who grew up in Kentucky, married a Swedish man and is now raising her kids in Europe. Her young sons have weak ties to the U.S., but eventually they'll have to deal with "onerous filing, every single year for the rest of your life." 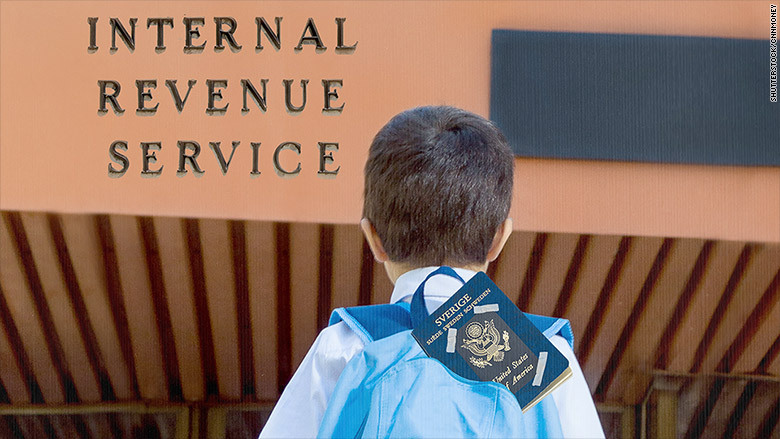 American citizen minors living abroad, like Gaisler's sons, are subject to the same tax obligations as children born and raised in the U.S. "If they meet the income threshold, they've got to file a tax return," said Scott Michel, a tax lawyer with Caplin & Drysdale. For children and teens, income can include earnings from a summer job, interest accrued on a college savings account opened by a parent, or even a family-owned business. While all expats -- kids or adults -- can exclude the first $99,200 they earn abroad from taxable income, they still have to file tax papers annually to prove they qualify for that exemption. Expat taxes are getting even more complex now that a new law, the Federal Account Tax Compliance Act (FATCA), has kicked in. The law requires banks to report foreign accounts held by Americans -- it's aimed at stamping out fat cat tax cheats, but it's made life for regular expats, and their kids, miserable. "It's crazy -- you have to hire a [certified public accountant] to deal with your kid's $5,000 or $10,000 of income," Michel said. "The compliance costs associated with all of this are somewhat disproportionate to the amounts at issue in many circumstances." On top of tax filing, minors are obligated to report all foreign bank accounts if they total a minimum of $10,000. "Grandma and grandpa give them money, and sock it away in an account in the child's name ... suddenly, everybody is in a pickle," said Chris McLemore, a tax attorney at Butler Snow. Gaisler's three sons are still young -- the oldest is six years old. So far, she hasn't had to file taxes on their behalf. "My concern is when ... they start working [and] have retirement accounts that are subject to double taxation," she said. Gaisler is also worried her kids will be denied for loans or a mortgage when they're older, as some foreign banks are even refusing to take on U.S. clients, rather than comply with FATCA. Experts say lots of Americans abroad are surprised to discover their foreign-born kids are U.S. citizens. "Many people don't realize how easily U.S. citizenship is passed from a parent to a child," said Steve Trow, founder of immigration law firm Trow & Rahal. It's a huge shock, considering the U.S. government could levy criminal penalties for tax evasion and failing to file, McLemore said. It's "tough to show a 15-year-old is a criminal mastermind...[but] parents are terrified." While a record number of expats, sick of dealing with all this, are giving up their passports, parents like Gaisler can't go this route -- the U.S. government doesn't allow parents to renounce on behalf of their children. It's only possible once they're older, usually at 18 years of age, when they can show they understand what it means to renounce, and prove that it's an independent decision. Gaisler plans to let her children decide later what to do with their U.S. citizenship. "As much as I tell [my children] how wonderful America is, they're not going to see it from my perspective," she said. "All they're going to feel is the IRS and filing their taxes every year."